Che Guevara was a renowned Argentine Marxist revolutionary. His wax figure is one of the exhibits in Seoul 63 Wax Museum of South Korea. Born in Argentina in 1928, Che Guevara was well known as Che. As a medical student, Che Guevara traveled around Latin America to broaden his vision. He was deeply shocked with what he had witnessed regarding poverty and social inequality and state monopoly capitalism. 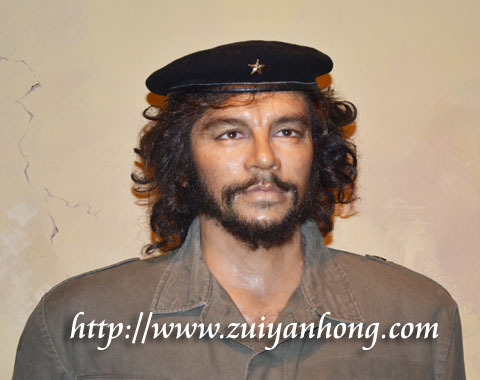 The unusual trip experience of Che Guevara aroused him to start revolutionary movement. He played an important role in the overthrown of Cuban Dictator Fulgencio Batista. Che Guevara was arrested and executed by Bolivian army when he was spreading out his revolutionary ideology in Bolivia. You can take photo with the wax figure of Che Guevara when you are visiting Seoul 63 Wax Museum.